After several centuries out of the public eye, an ivory carving of Saint Sebastian that has impressed experts with its emotional power and large scale is about to make a reappearance. The scholar-dealer offering the work, created around 1638 by an obscure Germanic artist, is asking $4.75 million. 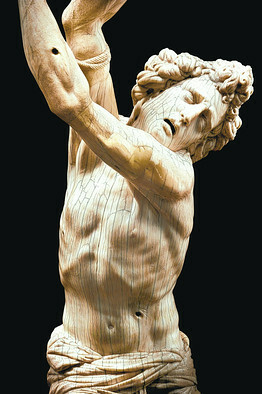 At 25.2 inches from right foot to left index finger, the carving is "amongst the largest ivory ﬁgures ever made" in Renaissance and Baroque times, writes ivory expert Eike Schmidt, head of the Minneapolis Institute of Art's Department of Decorative Arts, Textiles & Sculpture, in an essay commissioned for a catalogue on the work. It's "a powerful, expressive work invested with an extraordinary understanding of anatomy," says Nicholas Penny, director of the National Gallery in London. The curvature of the raw material, elephant tusks, crimped the ambitions of ivory carvers, and only about a dozen ivories of this size and period are known to exist. Most were crucifixes made for princes or other wealthy patrons. Where this Saint Sebastian has been for the last few centuries is unknown, but dealer Andrew Butterfield, who is offering it, bought it from a South American dealer last year. (Mr. Butterfield declines to say what he paid for it.) It was unattributed and needed cleaning. Mr. Butterfield, a Renaissance and Baroque scholar, researched the sculpture, pinning the attribution to Jacobus Agnesius, and paid New York's Metropolitan Museum of Art to clean it. Only two other works by Agnesius, who was known to have worked in Italy for much of his life, have been universally recognized by historians: Another "Saint Sebastian" is owned by Paris's Louvre museum, and the "Martyrdom of Saint Bartholomew," is in a museum in Albi, France. Both are much smaller. The known record for an ivory, a private sale, is about $7 million. Size alone would not make the work desirable, of course. In carving this nearly naked martyr-saint, who was tied to a tree and shot with arrows in the third century, Agnesius used the curvature of the tusk to create an arced, anguished body, supplementing it with two pieces for the arms. The piece will be on view, Jan. 21 through Feb. 4, at Moretti Fine Art in New York.